Here at the Marsden Eye Laser Clinic we use one of the worlds most technologically advanced excimer lasers, The SCHWIND AMARIS 500E. We believe this laser provides outstanding features that will allow patients to benefit from improvements in accuracy, precision, speed, comfort and safety. Automatic energy adjustment means maximum precision and minimum treatment time. Exceptionally small laser beams to deliver smooth and gentle treatment to the corneal surfaces for quick recuperation of the eye. 5D turbo eyetracker to provided fast registration and compensation of the slightest eye movements in five directions so to ensure that safety is obtained at every point in time. During the LASIK procedure a mirokeratome is used to create a flap to the cornea. The microkeratome is an instrument with a suction ring attachment and a microkeratome blade which moves across the cornea, stopping at a preset point far enough from the edge of the cornea to create a hinged flap of paper-thin corneal tissue. The microkeratome and the suction ring are removed from the eye and the flap is lifted and folded back. 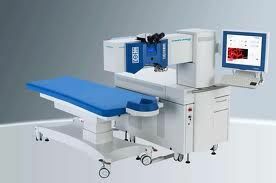 Allowing the cornea to be reshaped with the excimer laser Schwind Amaris 500E. The micro-keratome used at Marsden Eye Laser Clinic is the Bausch & Lomb Hansatome. The Hansatome is engineered for high volume surgical efficiencies and reliability. At Marsden Eye Laser Clinic, you will have an initial free complimentary assessment with an Orthoptist (Clinical staff), to determine if you are a good candidate and which type of surgery is best suited to your eyes and lifestyle. All your questions will be answered and all realistic expectations discussed. You will then proceed to a consultation with your surgeon for a thorough eye health examination and pre-operative assessment. This usually takes approximately 1-2 hours. Marsden Eye Laser Clinic uses the latest diagnostic equipment and technology to achieve the best personalised visual outcome for each individual patient taking into account their individual needs and requirements. Marsden Eye Laser Clinic uses the latest diagnostic instruments to measure the cornea using precise computerized topographical maps. These maps help your surgeon determine which type of surgery is right for you. The information of these maps determines the cornea thickness, curvature and general pattern to detect any irregularities. It is designed to provide anatomical data, that when considered with wavefront performance data will enable your surgeon to calculate an optimal corrective solution. In this way, it will assure that your pre-operative plan is optimized.